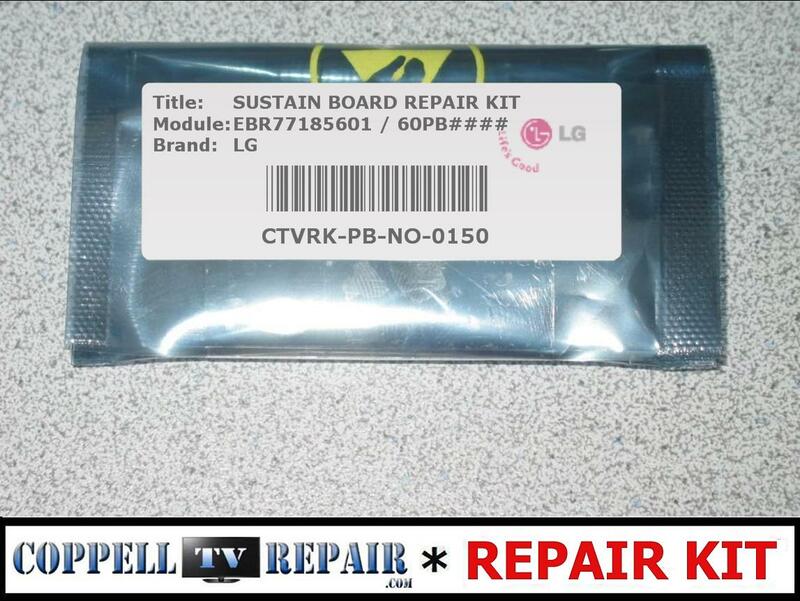 Coppell TV Repair LLC offers this repair kit for a common failure in YSUS board EBR77185601 shown on the pictures. 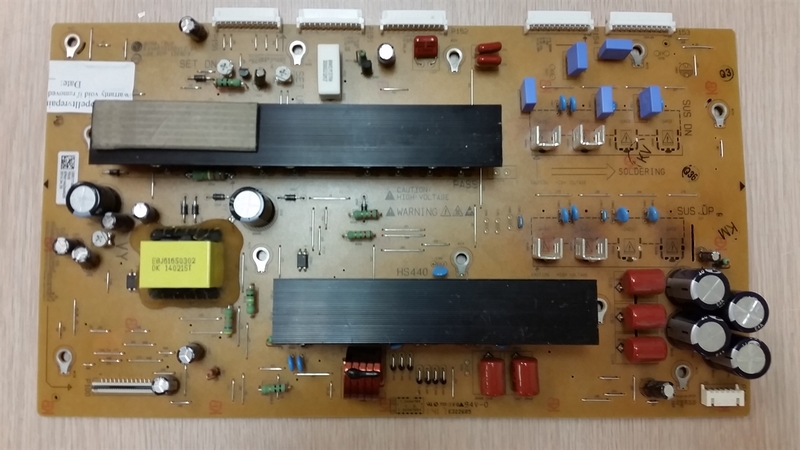 The kit addresses a problem we have seen and resolved multiple times on the board and includes the components that we have seen fail on it and which, upon replacing, brought the board back to functionality. Please read carefully the below specified failure symptoms, failure checks, kit contents and difficulty in applying it. 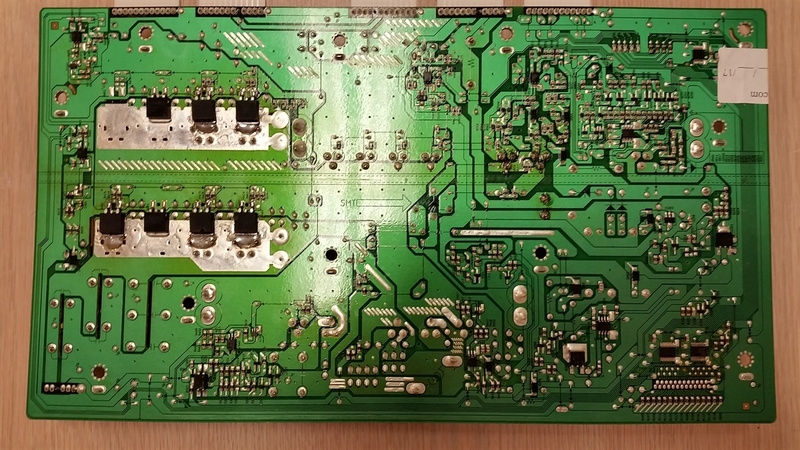 Shorted some or all of the following components located at the back side of the YSUS board: Q401,Q402,Q404,Q405 and Q406. R425||R418,R423||R419,R424||R417,R422||R426,R420||R427 - above MOSFET gate balance resistors; most likely just a pair will be bad on your board and it may not even be burned open, merely visibly burned, but we still recommend replacing it. We include the balance resistors for all switching transistors because it is possible that your board's batch may have been done with different resistor values than the ones we've seen (it is common for manufacturers to use different values in different batches); so if the resistors on your board are of different value you MUST replace all of them OR you must hack up replacements that add up to the same value as the rest in the group; for your convenience we include all needed resistors for both groups of transistors. C975 and C873 from top and bottom buffer boards; the caps bust sometimes when the YSUS fails. More components can be added to the kit over time if our knowledge changes. If you receive more or less components in the kit that are listed here please contact us for clarification! All components in the repair kit are brand new to the best of our knowledge. Where brand new replacements are not available we may use refurbished ones, but we prefer and practice utilizing brand new substitutes/equivalents to parts rather than refurbished originals. This is our general policy , not something special about this particular repair kit. Medium to high. Replacing SMD components is not the easiest task in soldering, but it is doable with some experience, patience and decent tools. Improper handling is very likely to damage the board, so if you are not certain you can undertake the service consider using our repair services instead. Coppell TV Repair LLC does not guarantee that this component/kit will resolve the problem in your TV. It is offered based on experience and technical information available to us at the date of publishing of this listing and known to be more or less common for the listed models. As every failure can be unique so can be every repair task. In addition, while giving the repair task a rough classification in terms of difficulty, Coppell TV Repair cannot evaluate each individual's qualities to perform the job or prevent operational errors even from skilled technicians. As such, no warranty is offered on this product. If you would like warranty please see if a REPAIR SERVICE is offered instead of a kit. Unless otherwise noted all our repair services do come with a standard 90 days warranty.